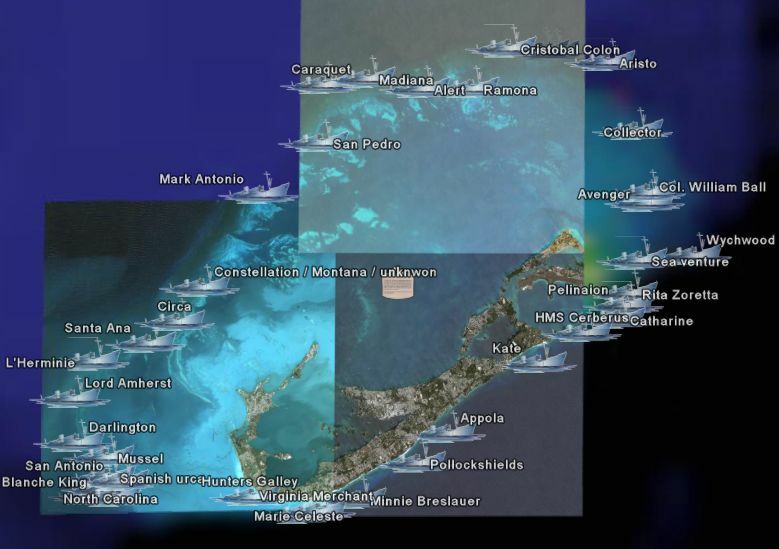 A member of the Google Earth Community, Bertrand Sciboz is from a French company called CERES (short for Centre Européen de Recherches et d'Etudes Sous-marines) which specializes in all sorts of underwater activity. Bertrand has posted many interesting collections of placemarks from his underwater experiences. 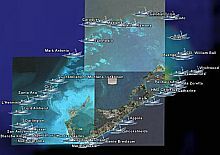 I thought this collection of Bermuda Treasure Shipwrecks in the form of Google Earth placemarks combined with the nice high resolution satellite photos of Bermuda was quite interesting. Each placemark contains details of the ship which was wrecked at that location and possibly what was found there. Bertrand says in his post (worth looking at as it contains photos of treasure and the man who made the map) he was given the map by Teddy Tucker, one of the most famous treasure hunter of the world and that the locations are only approximate. Bertrand has posted several other interesting collections which I will write about in the future. Excellent work Bertrand! There are even wrecks on Google Earth that you can actually see due to the fact that they are in such shallow water - like the "Vixen", sunk to block U-boats in the first world war. Have a look.